Located in Apra Harbor, Guam, Naval Base Guam serves as a strategic US naval base of the Joint Region Marianas. Units at Naval Base Guam include Submarine Squadron 15, Coast Guard Sector Guam and Naval Special Warfare Unit One. Additionally, 28 tenant units of the Pacific Command, Pacific Fleet and Seventh Fleet are stationed at Guam. The base serves as homeport to three Naval submarines - the USS Chicago, the USS Key West and the USS Oklahoma City - and a submarine tender - the USS Frank Cable. The US Coast Guard has three cutters located at Guam Naval Base - the Sequoia, the Assateague and the Washington. 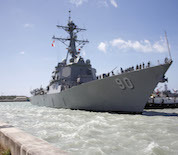 The cutters maintain aids to navigation in Guam and the Northern Marianas as well as assist in environmental protection, search and rescue and Homeland Security missions. This Guam Naval Base directory features the critical info you’ll need to navigate through the many facilities and recreational opportunities available on base.